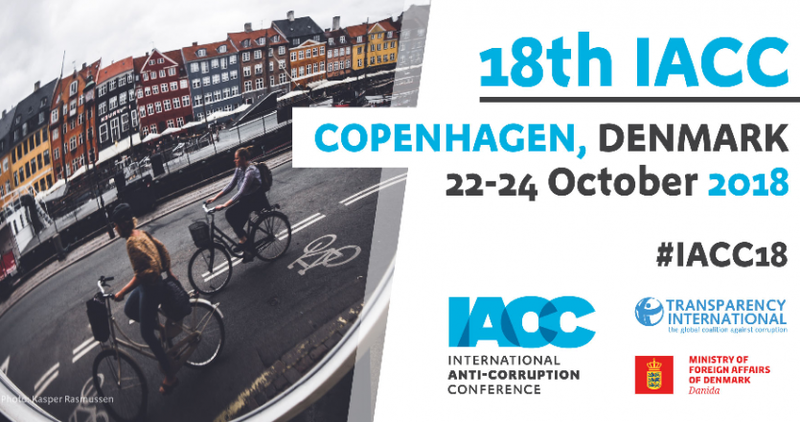 The International Anti-Corruption Conference (IACC) was held in Copenhagen from 22 to 24 October. 1,500 representatives from both the public and the private sectors, as well as from civil society and international organizations, took part in this edition. The theme chosen this year was “Together for Development, Peace and Security: Now is The Time to Act”. 70 sessions and panels followed one another during the three-day conference. They addressed current anti-corruption efforts around the world, alongside projects, innovations and new approaches in the area of promoting integrity, transparency and access to information, and with regard to money laundering, asset recovery, etc. Following its March meeting in Paris, the Network for Integrity put forward a panel proposal for the IACC. This proposal was selected and merged with the one of the World Bank. As a result, on 24 October 2018, a session on “promoting accountable and transparent institutions at all levels”, co-organized by the Network for Integrity and the World Bank, was held. Two members of the Network, the National Institute for Transparency, Access to Information and Personal Data Protection (Mexico), represented by Commissioner Salas Suarez, and the High Authority for Transparency in Public Life, represented by Emilie Cazenave, international partnerships coordinator, participated in this panel. Emile Van der Does, the coordinator for StAR, moderated the panel, which was also composed by Laura Pop, World Bank expert on financial and interest disclosure for StAR, and Tetiana Shevchuk, legal counsel for the Anti-Corruption Action Center, a Ukrainian civil society organization. The goal of the panel was to share innovative projects and experiences aimed at promoting transparency, ethics and integrity in the public sector. Ms. Pop reviewed the trends identified in 2016 in a StAR publication. In particular, she pointed out the advantages of opting for online asset and interest declarations. She also emphasized the need to think carefully about the scope of public officials concerned by declarative obligations, and of the missions entrusted to specialized agencies with regard to the resources allocated and the objectives set for the control of declarations. Mr. Salas Suarez addressed transparency reforms adopted in Mexico over the past five years, and the gradual establishment of an ambitious system of coordination between agencies and civil society to fight against corruption and promote transparency. Ms. Cazenave presented the digital tools created by the High Authority to collect and control asset and interest declarations. She also mentioned the open data strategy of the institution, which aims to improve how data from declarations and from the lobbying register are published, understood and reused. Finally, Ms. Shevchuk described how the Ukrainian Anti-Corruption Action Center is working to reuse the content of Ukrainian public officials’ asset declarations in order to conduct investigations and to make the list of persons particularly exposed to the risk of money laundering. Discussions with the audience focused on the development of digital tools, the strategies to involve civil society, the publicity given to declarations, the frequency with which to declare one’s interests and assets, the asset declaration of family members or its absence, and the means of investigation for instance. The Network will be able to draw on the exchanges that took place during this conference, which usefully complement the ones of the workshop in March at the OECD and of the session organized during the Open Government Partnership Global Summit in July in Tbilisi, for continuing discussions within its working group on digital tools to promote transparency and integrity.